In case you missed this over on Tammie's blog, here's a little valentine tutorial for you! She's hosting a week long "Sew Full of Love" week, with great guests and giveaways, including a gc to the Fat Quarter Shop! Hi All! I'm Heather from quilt.cook.keep. 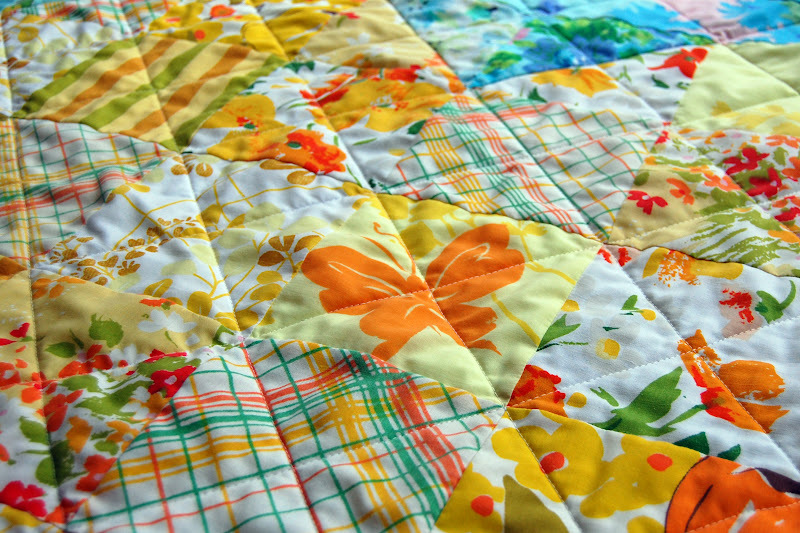 I'm so excited that Tammie invited me to share this baby quilt tutorial with you. Tammie and I met almost two years ago via flickr, when I was hosting the Bee Vintage quilting bee. Since then, we've kept in touch via our blogs and flickr. 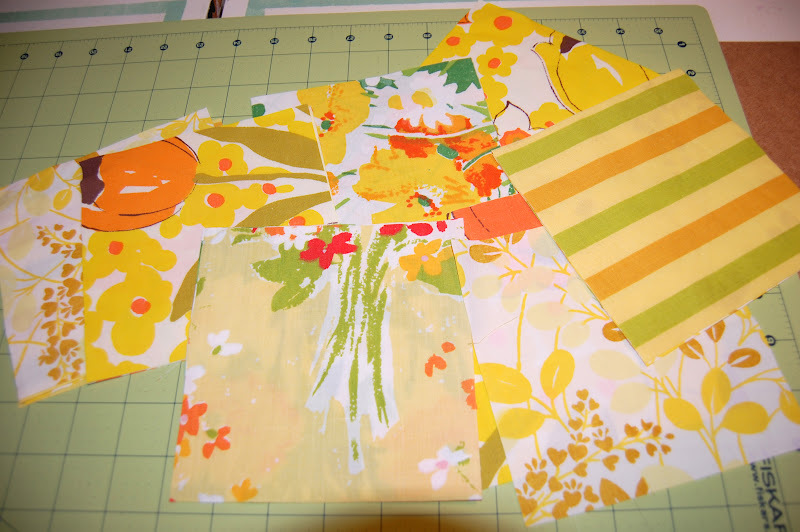 Since Tammie and I share a love of vintage sheets, I decided my "week of love" project should be made from them. 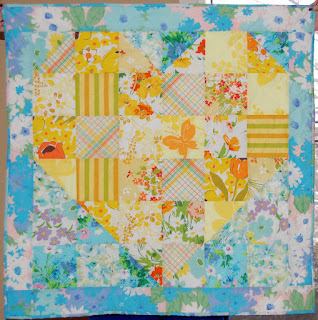 I made up this sweet little heart quilt for you. It's super simple, and can be make in an afternoon. Make one up for a little sweetheart in your life! 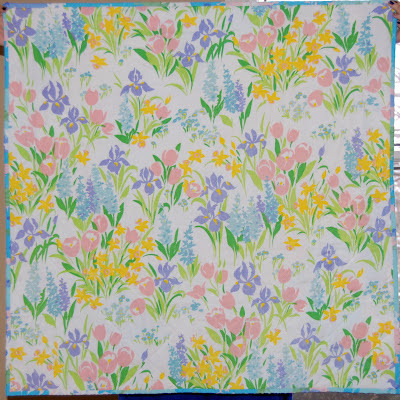 Batting and Backing: pieces: 42" x 42"
**Want to play with vintage sheets, but don't have any, or not enough variety? I have kits available in my Etsy store! See below for a special offer for craftytammie followers! First we'll make half square triangles. We're making them a tad over sized, so we can trim to the correct size. This allows for a little wiggle room (meaning we don't have to be perfect!) Take your 5 blue and 5 yellow 6" squares and make pairs of one yellow, one blue. Put these right sides together. Using a ruler and sharp pencil (I like mechanical pencils for this) draw a line down the diagonal of the wrong side of one of the paired fabrics. This line will be your sewing guide. At your sewing machine, sew a 1/4" seam on both sides of the drawn line. Cut the squares apart, on the drawn line. Press open (press towards the blue, or your darkest fabric) and trim to 5.5". Do this for all 5 pairs. We just make half square triangles! Next arrange your squares as above, or use the diagram below. 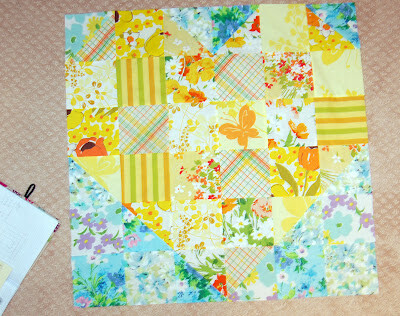 Now, we sew the blocks together to make the quilt top. I like to sew two columns together, then return those sewn pieces to my layout ~ mainly because I'm easily confused. 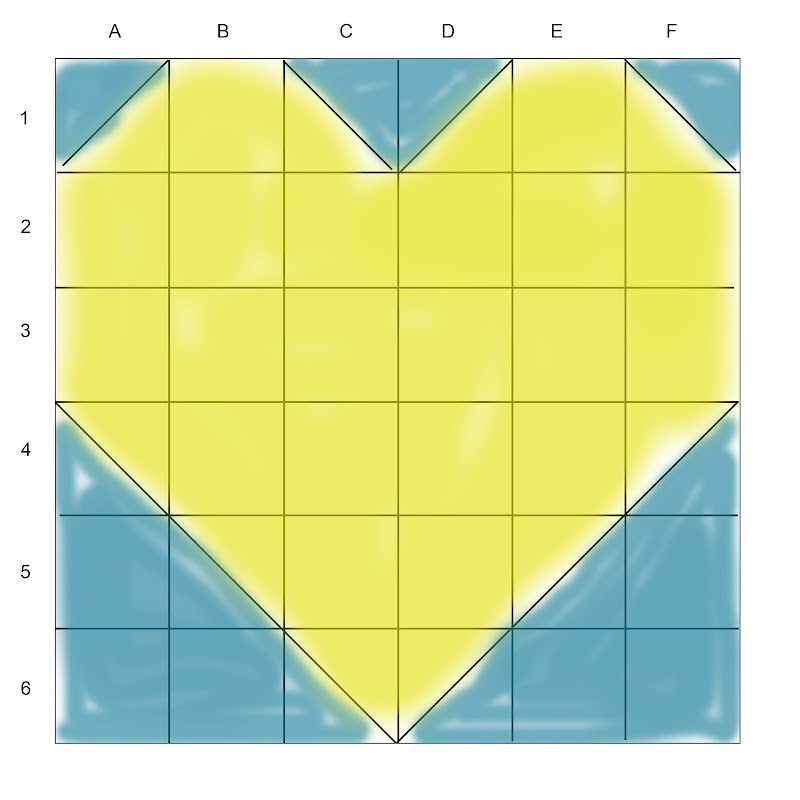 Take the squares in column B and flip over to the squares in column A. 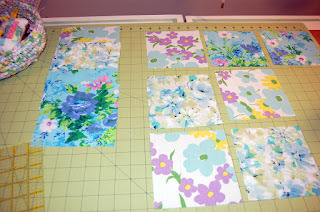 Chain stitch these together, lay them back on your design space (wall, floor, where ever) and clip connecting threads. Then flip row D over to row C and sew. Repeat with F and E. Then sew the AB unit to the CD unit. Then sew ABCD unit to EF unit. You should now have 6 complete rows, numbered 1-6. You'll want to press the seams on your rows. If you like to press your seams open, go for it. Me, not so much. For ease of construction (to reduce bulk and get pretty matching corners) press the odd numbered rows in one direction, and the even numbered rows in the opposite direction. 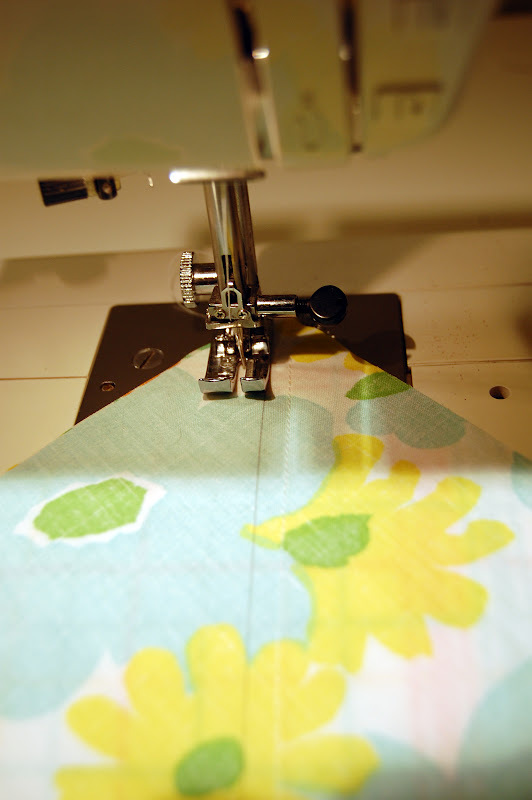 This will create lovely nested seams. Sew the rows in similar fashion to the columns. Flip row1 over row 2, sew. Etc, etc. Press your seams again (your choice of direction!) and our top is almost finished! Add the borders. 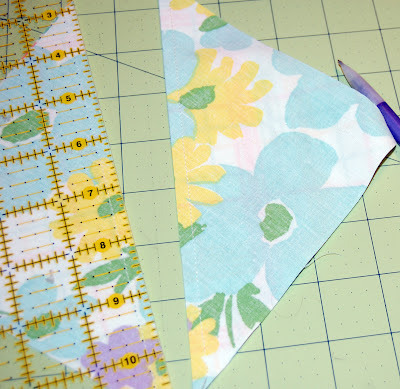 Add the two shorter border to the sides. Press seams towards the outside. Then add the two side borders. Almost done! Layer your quilt top, batting and backing. Baste. Quilt as desired. I did a simple cross hatch for the quilting. I used my longest ruler and an air dissolving type marker to mark the lines, then quilted on the drawn lines. 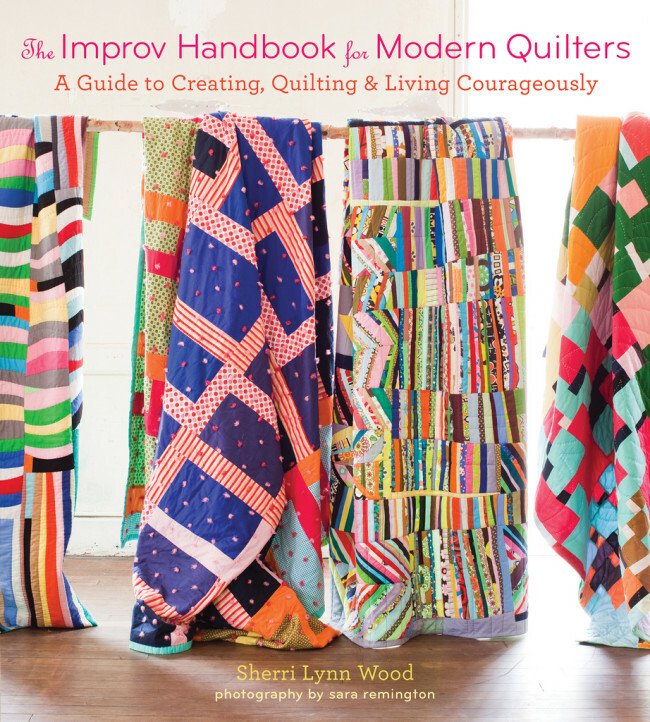 Trim, bind and you have a precious little quilt, for a precious little "love" in your life. If you have any questions, feel free to contact me via my blog. So, about that special offer! 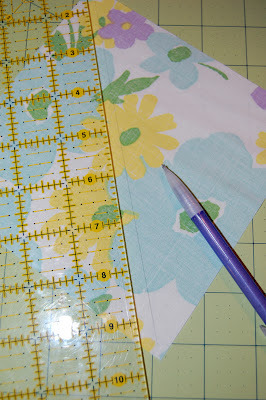 I've wanted to open an Etsy store for ages, offering up Vintage Sheet yardage and quilt kits. Doing this tutorial for you was the incentive I needed. 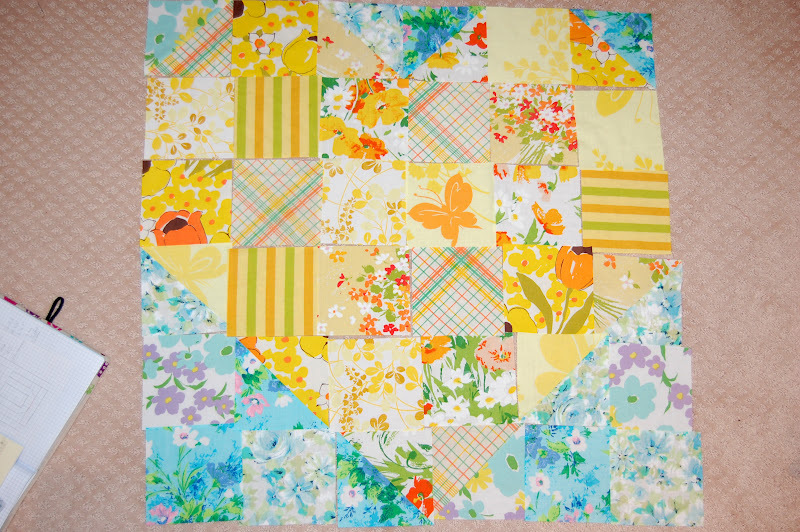 If you'd like to purchase a kit to make this quilt, please visit my Etsy store. 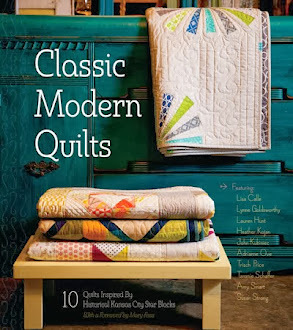 As a special Thank You, all of craftytammie readers will receive free shipping on quilt kits. Just enter CraftyTammie for your discount at checkout. Thanks for reading and hopefully checking out my shop! I'd also love it if you'd stop by my blog and say "hi" ~ you may see some other tutorials you like! 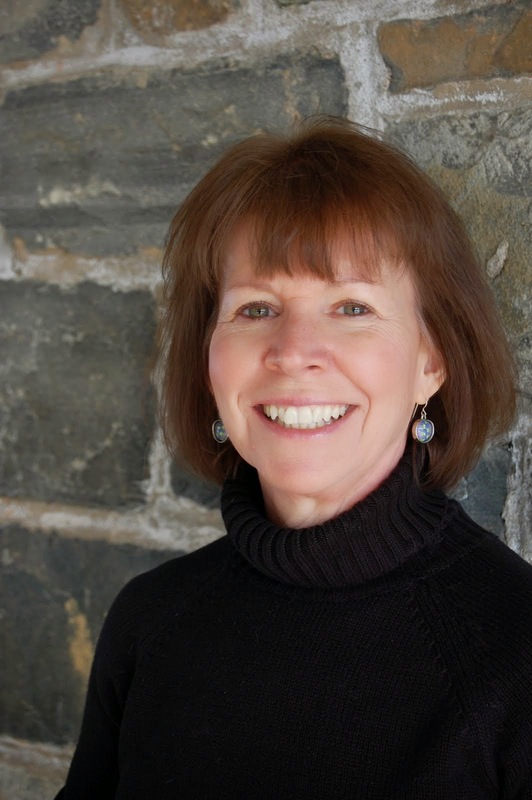 And a huge thanks to Tammie! She's put together a terrific week for us. 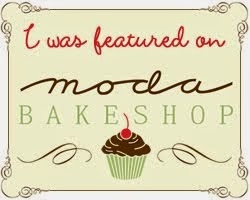 Be sure to check out her giveaways and her other guest's blogs. Tammie, you're the best! Here's wishing you lots of love this week and always! 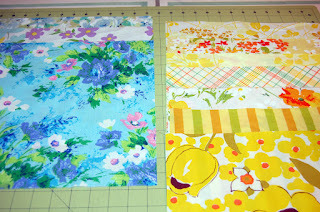 I have not sewn with vintage sheets yet. I look at some that I think 'fit' the definition at the thrift store, but then I am not sure. Very nice! I have quite the "collection" going of sheets. I've told myself I can't buy anymore until I use them! Yes, I sew with vintage sheets. I would LOVE to make that quilt~ How ingenious! LOVE IT! 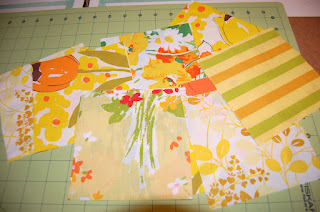 i love vintage sheets and am loving the tutorial! thanks! I follow quilt.cook.keep thanks again! I've never sewn with vintage sheets before, but I'd sure love to! Thanks for the giveaway opportunity. Fun! It's beautiful! I love that. Thanks for sharing the how-to with us. I have a few vintage sheets, but they are hard to find around here where I live. I'm saving what I have so that hopefully I'll have enought to do something like this one day. I'm a follower of quilt.cook.keep now. I love vintage sheets. I have a stash but have yet to make anything with them. I'm not brave enough to cut them! 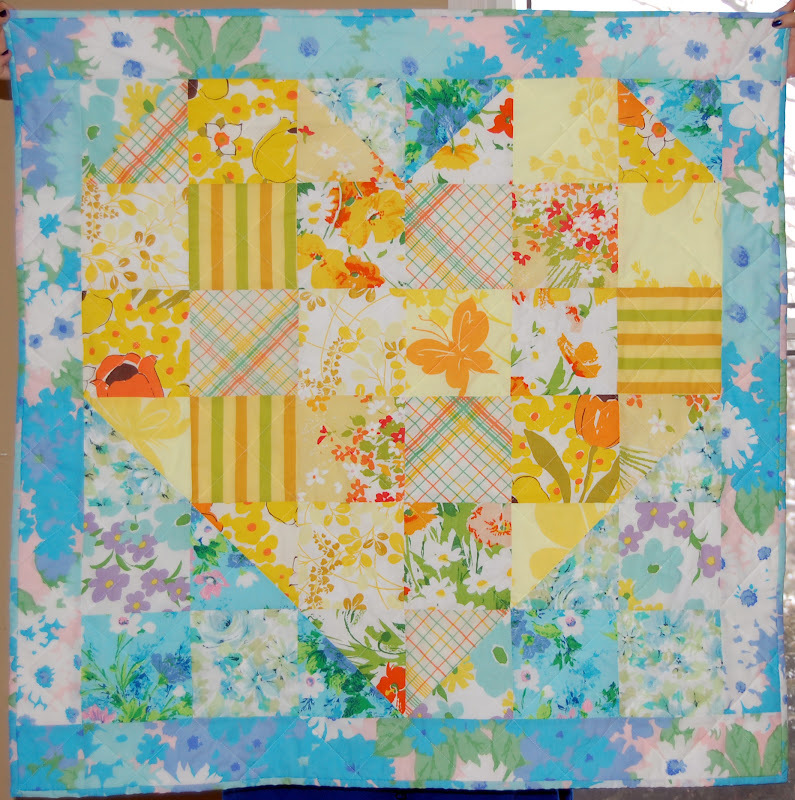 Thanks for sharing your tutorial for this adorable quilt. I just found your blog, and this amazing Baby Quilt was the reason I found it (via Pinterest). I look forward to finally cutting up some vintage sheets to make a few of these... Thanks for the tutorial! 100% cotton i buy it!